No, We Aren't Reinvading Iraq. If you read the right's number one news site, you may have left with the feeling that Obama has decided to launch a new invasion of Iraq. Of course that feeling would be totally wrong. President Obama announced on Monday evening that US ground troops ‘equipped for combat’ are being sent to Iraq – just days after claiming that no American soldiers would be deployed to the war-torn country. In a letter to Congress, the president said American troops will be returning to Iraq only three years after they left and their deployment began on Sunday. That’s how the article on the Daily Mail starts out. The UK publication has a long history of getting things wrong, making it a perfect source for Drudge. But they really don’t get it wrong here, but instead mislead. I quoted the first two paragraphs above, but what about the third paragraph? Obama said that their only purpose will be to protect U.S. personnel and the embassy in Baghdad – and not to join in the fierce fighting raging outside the Iraqi capital. So, we are sending troops into Iraq, but their only purpose is to protect our embassy and interests. This is a far cry from what Drudge is implying, which is essentially an invasion. 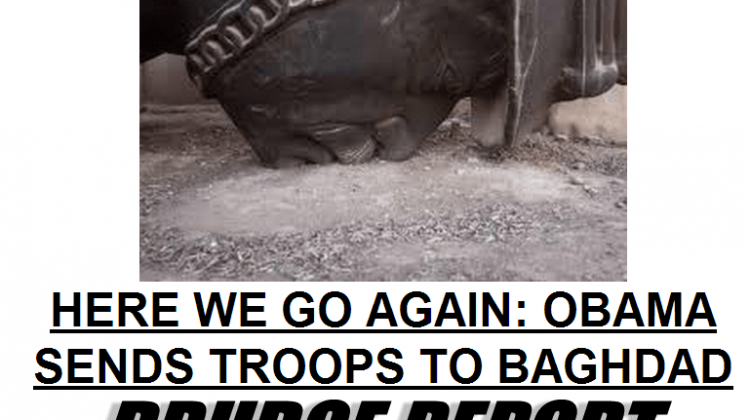 We know that Drudge has to realize the real reason for the troops, so why would he twist a headline like this? Saying “here we go again” is like saying “2003 all over”, but there is an enormous difference between protecting embassies and invading a nation. Reading his framing of this story, in one simple headline, leaves me to believe that if Obama would have sent troops in to protect our Embassy in Benghazi then the right would be raising hell over something else – the President going to war without a declaration of war from the Congress. It just shows that no matter what Obama does, he is always wrong. Take this as a lesson, never go by the headline alone, especially if that headline is on the Drudge Report. Instead, take a few minutes and read the actual story. It will most likely save you from looking like a complete idiot.